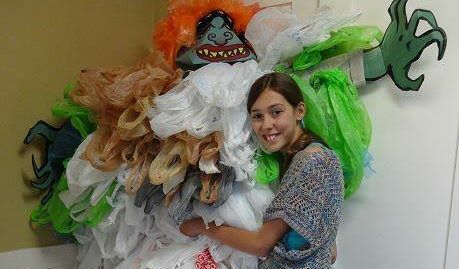 It isn’t hard to miss that one of the most influential activists in the bag ban movement, Abby Goldberg, AKA “Activist Abby“, is only 14. It also isn’t hard to miss is that her work has sparked not only debate and resulting bag ban initiatives, but she has been an inspiration to not only kids, but adults and politicians throughout the country and I would go so far as to stay, the world as well. She was even an inspiration to us here at Factory Direct Promos (FDP) as her work pushed us to create our bag ban map! This “kid”, activist firecracker is poised beyond her years and ready and willing to take on anyone who stands in the way of her goal to protect wildlife and our environment through her work to ban single use plastic bags. Q1) FDP – What was the spark that started you on this journey, how old were you when you started your activist journey to ban the single use plastic bag, and how old are you now? A1) Activist Abby – I am 15 now but, I started this journey about 4 years ago when I was in 7th grade when I was 12. I love animals and the environment so much and especially because I attended an environmentally focused charter school from kindergarten until 8th grade. One day I was looking at pictures online and I saw a picture of a seabird entangled in a plastic bag. Upon further research I found out more and more about all the animals killed from our plastic waste. That was definitely the moment I decided that I needed to change something and that my choices matter. I was doing the research because in order to graduate, I needed to design a two year project that would benefit my community and the environment. I chose trying to get my village to ban the bag. That is how the whole journey started. Q2) FDP – What experience stands out in your mind as one of the best you have had since starting the activist journey? A2) Activist Abby – The day I got to meet the Governor of Illinois and hand him my petition was one of my best days as an activist, and probably one of my favorite moments in general. The day started out hectic. My family and I were staying in a hotel in Chicago the night before because I was asked to come on Windy City Live, a local morning how, the next morning. I was super excited being in love with that show, but we found out the timing was going to be super close with the TV show interview ending right before the press conference. I did the TV interview and ran over to the Governor’s office. I was originally told he wasn’t actually going to be there to meet me, it was just going to be one of his representatives. Everyone there secretly knew he actually was going to be there and kept it as a surprise for me. Not only did I get a surprise meeting with the governor, but I was on TV again. It was just a surreal experience. Q3) FDP – Of course I have to ask you about your thoughts on the California bag ban. Does it go far enough? Will it have an impact on the rest of the country? A3) Activist Abby – I personally think it’s amazing that the people of California, especially the government reps. and the activists are working TOGETHER to try and get it done. The ocean and coastline especially suffers from plastic bags in this part of the country. It might not go far enough, but it’s a start and people are finally coming together on this! It is especially great because now other states can see that it is possible. The impossible is no longer, we can look at California and we can do this. I’m really hoping the Governor signs the bill and it is finally done and then maybe even more people will hear about this positive news! Q4) FDP – What is a typical weekday like for you? A4) Activist Abby – My weekdays are pretty much the same every day because of school. Theatre and Journalism are my favorite classes. I am a horse back rider and spend a lot of time at the barn after school. I also spend a few minutes each day working on my activism. This is mostly answering e-mails and other people’s questions about plastic bags and checking out what my other activist friends are doing about plastic bags. Q5) FDP – What do your friends think about your work? A5) Activist Abby – I would like to say all of them support me, and lots of them do but, I also have friends who just don’t get it. Actually, I don’t really broadcast what I do, unless somebody asks me about it. Being noticed at school for this is not really my goal and I don’t want to seem like I am showing off. I would rather spend my time and energy on kids or people who want to make difference and want to know why plastic bags are bad. Q6) FDP – What is your favorite thing to do on the weekend? A6) Activist Abby – I absolutely love movies so my favorite thing to do is just get together with some of my friends, grab some popcorn and just spend all day watching movies. Or just hanging at the barn too. Q7) FDP – What is your favorite inspirational quote? A7) Activist Abby – There’s a lot of good quotes out there but one I live by and use a lot in my speeches and presentations to kids is “if you change nothing, nothing will change.” I really take to heart what this quote is saying. I can’t just sit back, especially if a simple and easy change can mean so much. There are a lot of problems out there, I can’t solve them all or even begin to understand them all, but if bringing your own bag can make a difference, I’ll do it! And to people who say one person won’t make a difference, that is just silly. I can’t tell you how many times people have told me that they will try and remember their own bags when they see me with mine. All I ask is people try and change! Q8) FDP – Who are some of your favorite activists under 20? A8) Activist Abby – I am a big fan of Rachel Parent and her work against GMO’s. Her speaking skills are especially amazing. She speaks with such poise and confidence. It is clear when she is talking that she has done her research and knows what she’s talking about. She’s not just some kid, but she’s taken very seriously by adults everywhere. Abby, I am pretty sure you and Rachel have a lot in common…no chance either of you “kids” will not be taken seriously by anyone. I takes courage and guts to take on this mission as Abby has and we applaud her work, thank her family for their support, and we are here doing our part to help her in her mission. We really love Abby and the work she does and we are ready, willing, and able to help her in any way we can! Show us your support of Abby in the comments below!